‘Tawafuq’ as an idea refers to decision-making not through formal processes relying on potentially divisive majorities but rather informal processes. 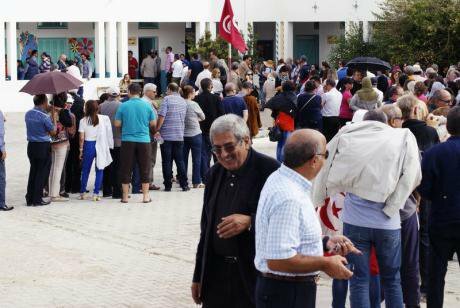 Tunisian voters queuing to vote in parliamentray elections, 2014. Elyes Jaziri/Demotix. All rights reserved.Across the Muslim world, an apparently endless stream of brutal violence is drowning out the memory of the Arab Spring. All the hopes that it unleashed seem to have vanished. But there is one exception to the rule. In Tunisia – where the story began and where four years ago this month, the revolution ousted long-time president Zine El Abidine Ben Ali from office – there seems to be a happy ending of sorts. The swearing-in on 31 December of Béji Caïd Essebsi as president marks the latest step – following on from the October parliamentary victory of the secularist Nidaa Tounes and the January signing of a new constitution – in a journey of compromise. This compromise, forged across religious and political divides, could offer an alternative political model for other Arab nations. Tunisia’s revolution – spontaneous, dramatic, and resulting in the fall of the regime – opened doors that had remained closed for decades. But the people who drove the revolution, the members of the public who sought a political order respectful of its citizens, did not seize power. The revolution also freed a number of forces that an oppressive regime had kept under strict control. In the country’s first post-revolution elections, some unexpected actors – long-banned in pre-revolutionary Tunisia – were brought to power: the Islamists. Their election greatly challenged those who had started and led the revolution. The Islamists entered power with an altogether different vision to that of the revolution. Other tensions also emerged, including between traditional and newly established elites, between the religious and the secular and within the Islamist movement itself. Had the democratic rule of the majority been unthinkingly applied, confrontations between Islamists and other forces would only have deepened. Exacerbated by the volume of weapons throughout the region, these confrontations may have resulted in further strife, turbulence or even civil war, with the return to dictatorship another feared outcome. Instead – through consensus between actors on all sides – an informal, political process was agreed upon to lay the groundwork for a proper beginning to the democratic transition. In September 2011, a landmark accord – “la déclaration du processus transitoire” – was signed. Its Tunisian architect, Yadh Ben Achour, compares the document to a similar declaration made in June 2011 by Al-Azhar University in Egypt, considered a leading global centre of Islamic scholarship. Both documents seek to set out guiding principles that encompass both religious identity and democratic norms; in the case of Tunisia, the declaration – achieved through dialogue, or ‘Tawafuq’ – helped to set the tone for the new post-revolutionary constitution. ‘Tawafuq’ as an idea refers to decision-making not through formal processes relying on potentially divisive majorities but rather informal processes relying on tacit acceptance and consensus, with all stakeholders driven by the interests of each and every citizen. Constitutions, in principle, are legal charters that define the way in which a state is governed. In the modern Muslim world, they have also played the role of formal declarations that signal major changes of direction. They spell out ways in which the polity distances itself from past habits, including habits supposedly based on religion. Constitutions offer a means to redefine relations between religion and politics, using the ‘spirit of religion’ as a way to reject obstacles to the rule of law and the sovereignty of popular will. Tunisia’s January 2014 constitution is a charter combining a number of principles that respond to different aspirations and are not easy to reconcile. The constitution reflects the compromise that was found through discussion, between principles that include the respect of a nation’s religious identity as well as the implementation of modern democratic rules. It also reflects the sometimes substantial concessions made by both camps, which would not have been possible in a situation of extreme crisis. The Islamists in Tunisia conceded, significantly, the freedom of conscience or religious freedom, which no other Muslim-majority country has yet accepted. They agreed, for example, that Takfir – the accusation of apostasy, which could be interpreted as an invitation to murder – is a crime punishable by law. They also conceded that sovereignty lies with the people, and that politics must be governed by democratic norms. On the other hand, their opponents conceded that there is a sacred realm, which deserves to be protected and respected, which is part of the national identity, and which should not be exposed to hostile assaults. In developing this consensus and completing an electoral process, Tunisia has recognised that the adoption of democracy as the framework for every legitimate government is in fact a non-democratic process. It requires a founding extra-democratic agreement that helps to overcome deep differences between groups of people and enables them to adopt a new political contract. In Tunisia, there was recognition that at decisive moments such as during the design of a new constitution, the principle of majority rule could be divisive, and not allow a real rallying of all political perspectives. For this reason, the idea of building a consensus through dialogue, or ‘Tawafuq’, was seen as a pathway to better outcomes. And with the conclusion of a peaceful democratic transition under this new constitution, Tunisia appears to be resolutely moving along that path. The question remains as to whether other Arab nations will follow in its footsteps. Some of this analysis is drawn from a forthcoming article by Professor Yadh Ben Achour, lawyer and President of Tunisia’s Higher Political Reform Commission.